Sekforde mixers were created with the simple aim: to unlock new flavours in dark spirits. 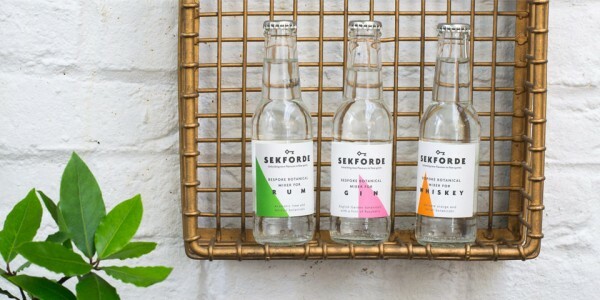 Unlike the sugary or artificially-flavoured mixers such as ginger beer and cola – mixers that tend to mask the flavours of whiskey and rum – Sekforde is created to specifically enhance the spirit’s profile when served as a long drink. Perhaps this is partly why white spirits, and in particular gin, have seen a boom in recent years: there are more ways to enjoy them simply at home. But for rum and whiskey, there's not really a middle ground between elaborate cocktails and sipping neat - or at least, one where you can actually taste and appreciate the craft and the unique composition of the spirit. This is where husband and wife team Tom and Talula spotted an opportunity. As big rum and whiskey drinkers, frustrated by their lack of options, they set out to create a better way to enjoy their favourite spirits. The result was Sekforde, bespoke botanical mixers designed to complement and enhance the flavours in dark spirits and lovingly named after the East London street where Tom and Talula first dreamed up the idea. Then, due to popular demand from gin-loving, tonic-hating drinkers, a third addition came along - Sekforde Botanical Mixer for Gin. With no sugar, no quinine - just light, garden botanicals and a kiss of soft raspberry, it's the perfect partner for lower-calorie sipping without bitter bubbles! The Whiskey Mixer uses the key botanicals of orange, rosemary and gentian. The sophisticated balance brings the complexity of the spirit to the fore, lengthening the finish and opening the palate to notes that might not be present when sipping neat. Similarly, the Rum Mixer uses botanicals of lime, mint, sage and rose to bring depth to the sweetness of rum and lift the finish. The Gin Mixer has a soft, natural sweetness that works well with the gin's juniper, and lets the true flavours of the spirit shine through and lends a sophisticated depth and length when mixed with gin. Tom and Talula recommend serving the whiskey of your choice (avoiding Islay single malts) over ice, pour in Sekforde whiskey mixer and add a twist of orange and a sprig of rosemary. For rum, again over ice but with with Sekforde rum mixer, a twist of lime and a sprig of mint. And for gin, serve over ice, add the gin mixer and a garnish of pink grapefruit with either a sprig of rosemary or sage leaf. Low in sugar, each 200ml serve is under 40 calories, and contains no artificial flavours, preservatives or sweeteners.